Being new to learning how to aim and hit your target with a firearm can be difficult. While most professionals would recommend you get a sight, they aren’t always needed. However, if you want to learn how to enhance your performance with a gun quickly, then getting a sight can make a huge difference. When it comes to hunting, you may have to hunt prey in the dead of night, making it hard to see with the naked eye. A night vision sight can help you land your hit, and reduce your chances of missing the target entirely. 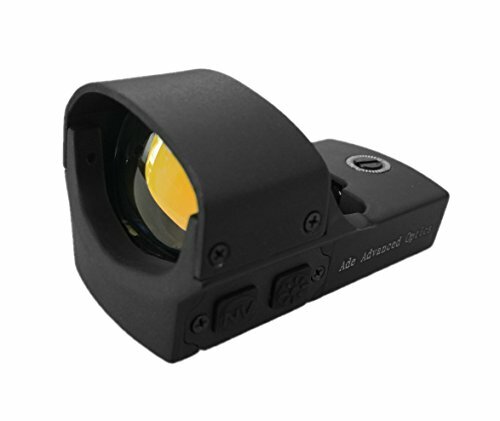 In this article, we will review the Ade RD3-011 Night Vision Sight. While other sights on the market tend to focus on helping beginners learn how to aim, this one focuses on providing hunters with enhanced accuracy when it comes to day or night hunting. This model is highly durable, has multiple settings that can be adjusted, and includes a strong and sturdy exterior that is shock-, rain-, and fog-proof. This product has been designed for hunters or anyone who wants a compact and lightweight sight to help increase their accuracy. Because of the design, it’s targeted more towards experts, but we believe that this model can be useful for beginners too. As long as your goal is to increase the number of times you hit a target, we think the Ade RD3-011 Night Vision Sight will be useful to you. The scope is equipped with six different brightness settings, which can be adjusted through a switch. This feature comes in handy when you’re hunting for long hours, as you’ll be able to adjust the brightness of the scope to the time of day. This will allow you to hunt in dark areas, night, or bad weather conditions. Hunting in the dark? The night vision feature will come in handy during these situations. Instead of missing your target because of having poor vision, you will have full night vision capability with this sight, which can help illuminate your target and its surroundings. This model features a heavy-duty design that is lightweight and compact. The exterior casing is made to be shock-, rain-, and fog-proof, which can help when it comes to hunting in undesirable weather conditions. The lens features a ½-inch thick glass lens that is made to be shock- and impact-resistant too. This increases the overall lifespan of the unit. As for the vision of the scope, the magnification is 1.0x with an exit pupil of up to 33mm in diameter. The unit also includes a 21mm weaver mount base, which makes it easy to attach and adjust the diameter of the scope. To use this night vision sight, you will need to pull the trigger switch that is located on the foregrip. This will activate the unit, and you will be able to press the switch that controls the different modes. Want to check out a similar device? Try the Bushnell Trophy TRS-25 Sight. This model features a trophy red dot and has a lens diameter of 25mm. There are three different MOAs that feature dot reticles. This unit helps with target acquisition and has a total mount length of 1.1 inches. The lens features a bright high-contrast coating, which is installed with a reflective LED light to help create the red dot sight. As for the red dot, if the dot becomes blurry when it’s displayed on your target, then you can adjust the settings such as the dot intensity to meet ambient lit environments. The scope has multi-coated optics, which allow hunters to see their target in dim- or low-lit conditions. As for the exterior, its waterproof, shock-proof, and fog-proof coating allows the unit to last through the worst conditions. Don’t want to put your hunt on hold just because the weather isn’t accommodating to your schedule? A night vision sight not only can enhance your performance and accuracy, but it can also provide you with better vision in dim lit conditions. The Ade RD3-011 Night Vision Sight features multiple settings, which can help adjust to your surroundings, making everything more visible. Lastly, this unit has a well-built exterior that is meant to be durable and long-lasting.